Let steaks stand for 30 minutes at room temperature.Sprinkle the rub evenly over steaks. Heat a large cast-iron skillet over high heat. Add vegetable oil to the pan and swirl to coat. Place the elk steaks in pan; sear 3 minutes on each side or until browned, longer if you desire more doneness. Reduce heat to medium-low; add butter to the pan. Carefully grasp pan handle using an oven mitt or folded dry dish towel. Tilt pan toward you so butter pools; cook steaks for 1 1/2 minutes on non-butter pooled side of pan, basting steaks with butter continually. Remove steaks from pan; cover loosely with foil. Let stand 10 minutes. 4.Cut steak diagonally across grain into thin slices. Or, keep them whole if desired. Tear the bread into large pieces and almonds put into a blender and process until they are finely ground. Add the roasted red peppers, vinegar, olive oil, tomato paste, and pepper flakes and process until the mixture is fairly smooth, about 1 minute. In a medium saucepan, heat the oil over medium heat. Add the garlic and paprika and cook, stirring, until the garlic is fragrant but not browned, 20 to 30 seconds. Add the pepper mixture and cook, stirring, until heated through and thickened slightly, about 2 minutes. Add heavy cream and heat until just warmed through. Fold in finely chopped basil. Put into a serving bowl and set aside at room temperature until ready to serve. 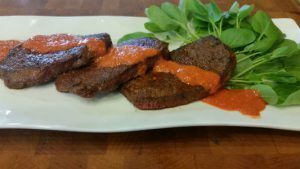 *this is a rustic sauce that pairs well with game like elk. For a smoother sauce, strain the mixture through a fine mesh sieve prior to adding the basil to the sauce.